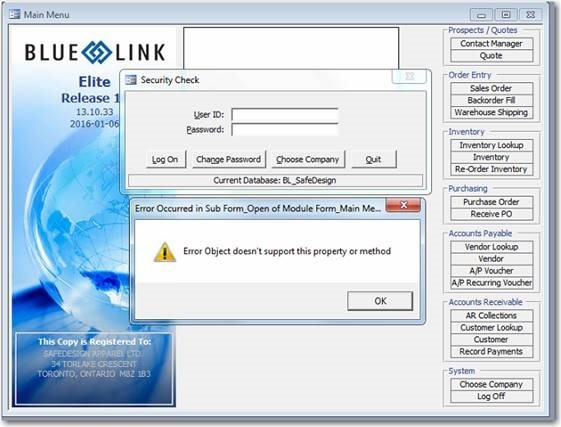 Msg 207, Level 16, State 1, Line 1 Invalid Column name ‘modified_extent_page_count’. That failure is happening because there is no column ‘modified_extent_page_count’ in the DatabaseName.sys.dm_db_file_space_usage views after the application of SQL 2016 SP2. If as in my case a restart is required, the setup will tell you that. Restart the server then repeat this process and you’ll be able to click through the wizard to the end. 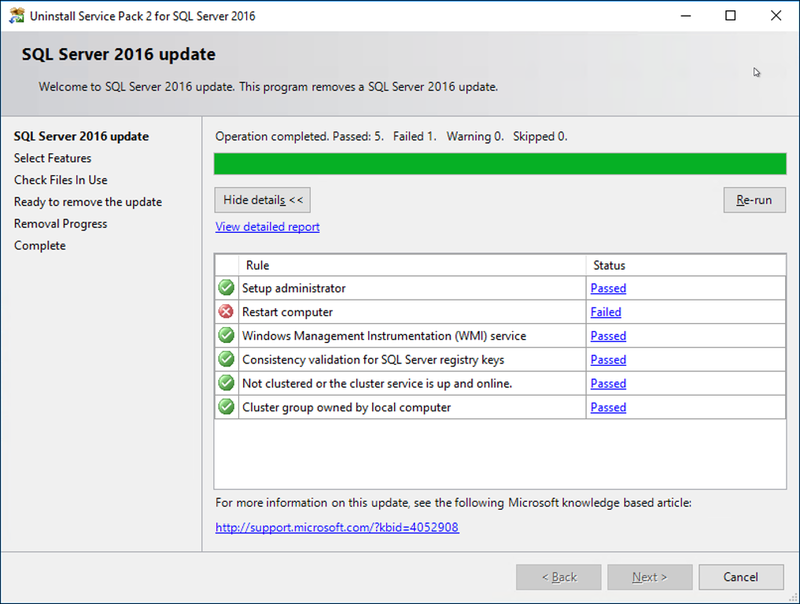 When the service pack removal is complete, backups will work once again. –Copy the results of the script above to a new query window and execute to turn SQL Change Tracking off on the tables for which it was enabled, and then run a command like this to disable change tracking on the database. … but only if the Input Mask property is left blank. This is true even if you happen to use Microsoft’s own Input Mask Wizard to set the input mask. Simply removing the input mask solves the problem – if you can convince your end users that they no longer need the input mask! Why are so many people falling for copy/paste bait threads lately? Copy/paste Facebook threads are the modern day equivalent of chain letters. The people who start them are doing so to see how many people that they can trick into doing it. It is a form of social engineering, a psychological test to see what works and what doesn’t – what words and phrases can we use to evoke sufficient emotion in the reader to make them do what they were told to do? (i.e. copy/paste). It is not hard to imagine this being done on purpose so that the data of who follows the instructions can be data-mined and correlated with which technique worked. You could be telling a data-miner which techniques will work ON YOU. These are the messages that start with a warning or something scary that sounds true. The people who share these are concerned about their friends and probably want to protect them. These are the "add this legal notice to your profile to stop your pictures from being used in ads" ones, the "someone is spoofing profiles" ones, the "make sure you change these privacy settings or else" ones. They all say something scary and they all share in common that you must "copy/paste" the message and "Not just share it". If you’re being told to copy/paste it then it should immediately seem suspicious to you. Take some time, research the issue, find an article in a reputable news media outlet, search the Internet to see if that phrase or keyword shows up as a known fraud or as something that has been disproven. Really want to project your friends? Stop spreading fear. These are the messages that try to make you "test" who your friends are. The "did you read this whole post" ones, the "I’m trying to figure out who only likes my photos and doesn’t read my text so read this and copy/paste it to prove your friendship" ones, etc. All you figure out when you do this are which of your friends are gullible, and depending on the content of the message, which of them you can manipulate using guilt. This is not data that you should be sharing about yourself. This is not data that you should be asking your friends and family to share about themselves. If you really are feeling insecure and want to know who your real friends are? Ask them to private message you or to share a story about a great moment they shared with you or of a great memory that they have of you. Better yet, reach out to them and share one of your memories. So how do you know if something is worth copying or not? The answer is simple: if the thread ends with the phrase "copy/paste" just DON’T DO IT. If if the thread ends with instructions that "you must follow exactly" then it should be considered highly suspicious. Just like chain mail, these threads will only stop when a critical mass of people STOP DOING IT. Stop and think about WHY the original message is asking you to copy/paste instead of sharing or adding your own original thoughts. The message is likely crafted to make it seem to your friends and family reading the message as though the thoughts expressed were yours. But by definition since you just copy/pasted it they are NOT your own original thoughts! There is a word for passing someone else’s thoughts off as if they were your own: Plagiarism. If you agree with what someone is saying, like it, or share the thought and add your own original thought. Do the research, credit the original author, but if a friend asks you to copy/paste something, be a real friend: Just Don’t. The thing that’s a bit strange to me at least about the SHRKINFILE command is that it uses the internal database name instead of the mounted name. So having a script generator like this one to create the script is invaluable! 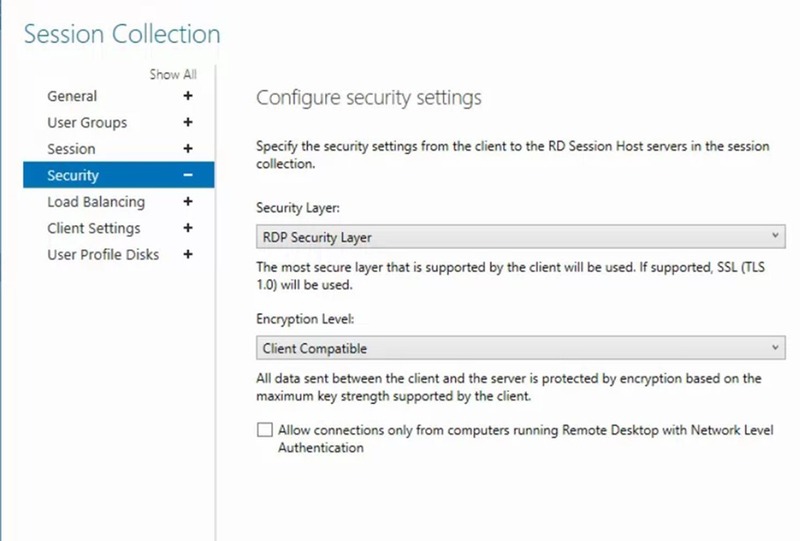 The last thing that most of these articles do not mention is that if other users have detached databases in the folder structure that you’re trying to move, then their user accounts (or the SQL Service account if they were using SQL Auth) will then have exclusive security permissions to the detached .mdf/.ndf/.ldf files. Note: in my case just granted “everyone” full permission to the SQL Database files, because when I move these files to the destination server the destination server’s folder permissions are going to impose new restrictions. In all cases, the update replaces mscomctl.ocx with a new version 6.01.9846. Microsoft had previously “broken” this control before, however last time it happened, the issue was with the registry. A simple work around of registering an old version and re-registering the current version typically worked to fix the issue. This time, that work around does not appear to work. 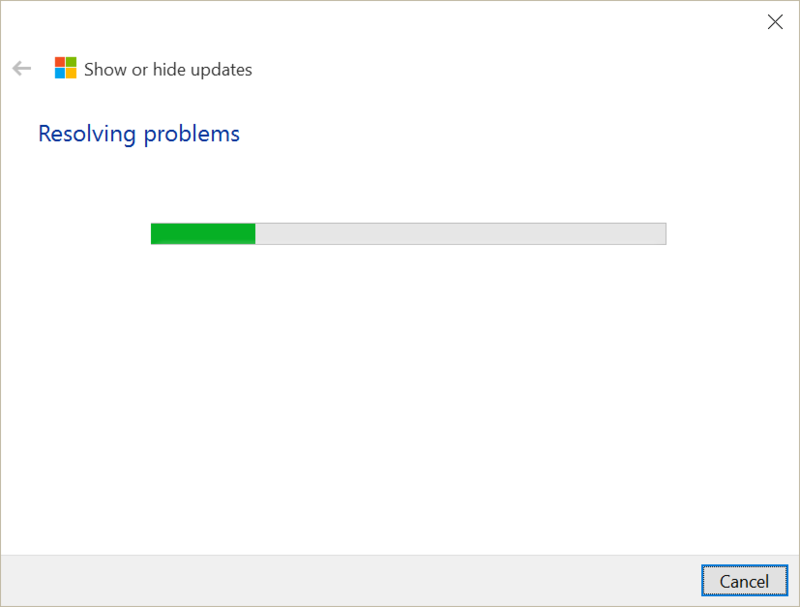 As of this writing, the temporary work around is to un-install this update. Blue Link is working on a permanent fix that will allow the application to work with the new version of the control in place. Until then, the approach to remove the update is different depending on the version of the operating system that you have installed. 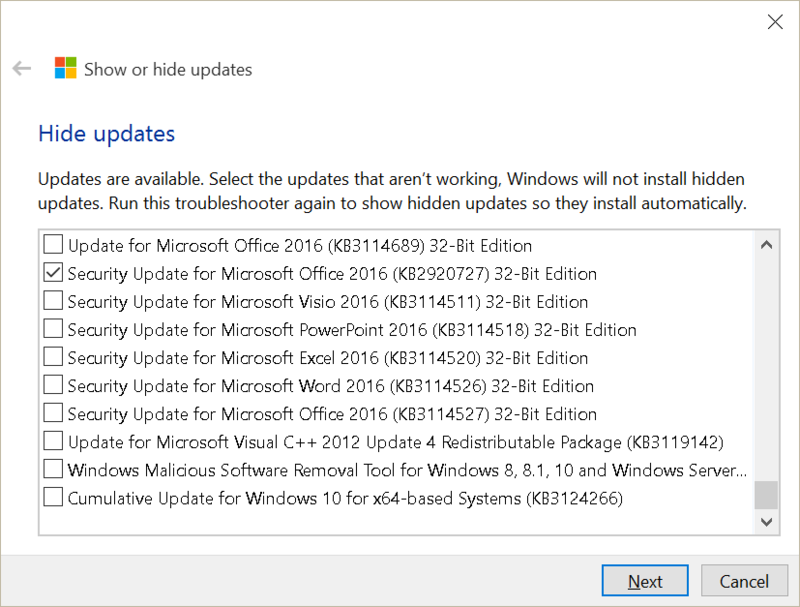 Select the Security Update for Microsoft Office _____ (KB_______) that matches your version of Office and the KB# that updates mscomctl.ocx, then click the Uninstall button at the top of the screen. 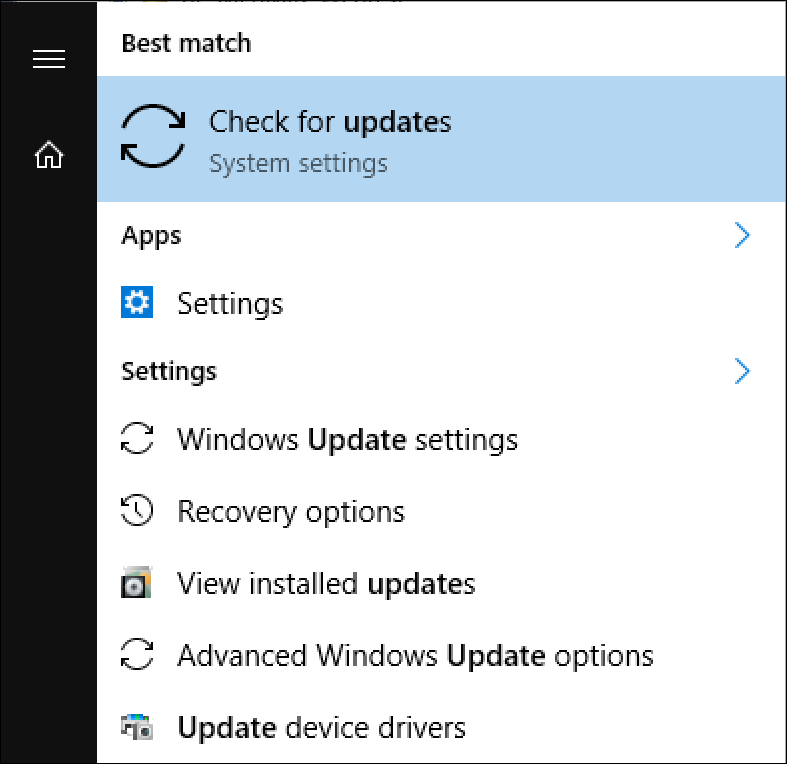 Note: Depending on your windows update settings, it may almost immediately attempt to RE-INSTALL the update, so it is important that when this step is complete that you do not unnecessarily delay before performing the next step of blocking the update. 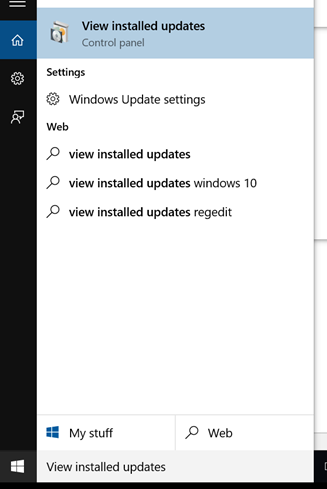 To Block the update on Windows 10 you now have to download a special tool since Microsoft removed the built-into-the-os version of the feature. 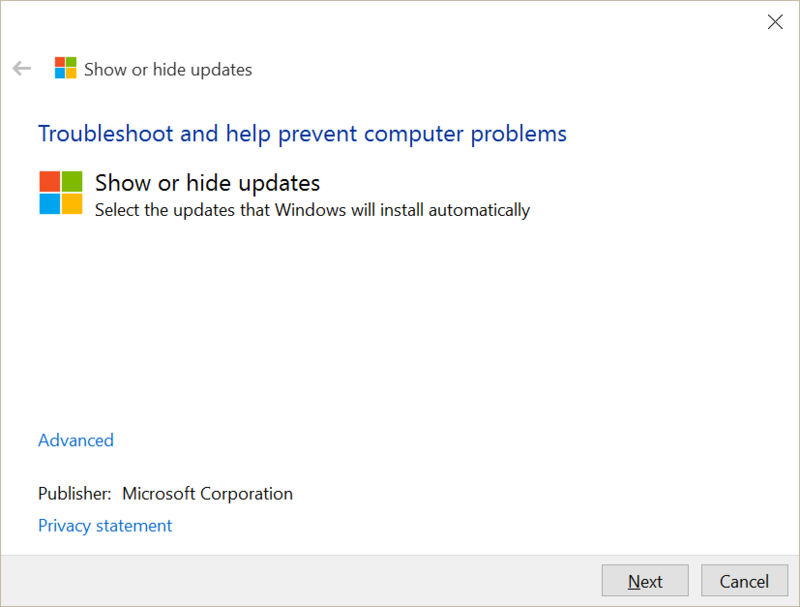 The procedure on Windows 8.1, and Windows 7 is different. This blog will be updated on a regular basis as new information is made available. Note: If you can figure out a way to restore functionality without removing the update please post a comment below. 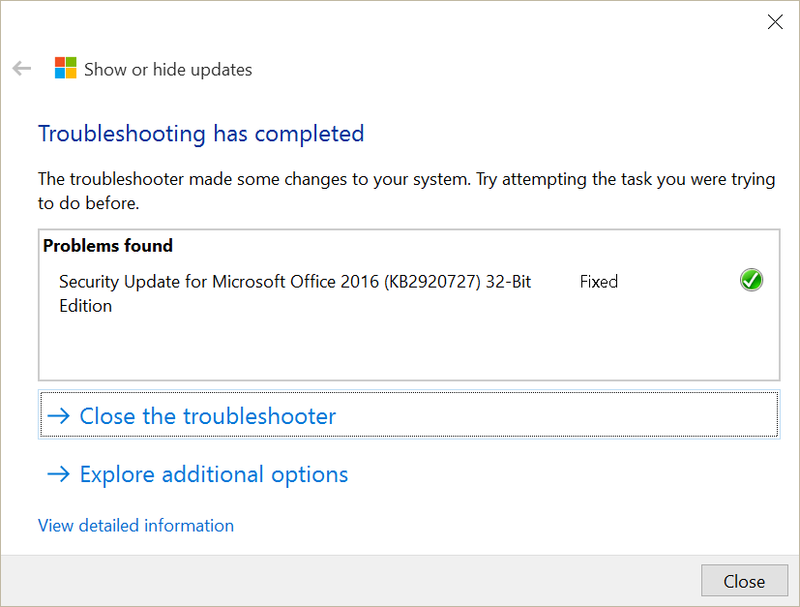 What we have been able to determine is that as Microsoft patches the mscomctl.ocx file new GUIDs get created. The old GUIDs then become pointers to the new GUIDs, but on some cases, those old GUIDs are still pointing to other GUIDs which now no longer exist. To fix that problem, those old invalid pointer GUIDs need to be deleted, but Microsoft’s installer for the KB does NOT detect and delete the bogus pointers successfully resulting in the controls not working. One of our developers has created a utility that will crawl through the mscomctl related registry keys, deleting most. When that utility is done running he has instructed us to then copy/paste some additional registry deletion commands to an admin command prompt. Since I don’t expect readers of this blog to simply trust running a .net executable I’ve asked the developer to give me the files and the source code so that we can post it here. UPDATE: 2016-04-20: I wasn’t able to get the source code, but I am making a version available for download here. change to the folder containing the mscomctl.ocx file (C:\WIndows\System32\ if 32-bit or C:\Windows\SysWow64 on a 64-bit machine). Step 2: Run the BLRegClean_Net.exe utility (Source code coming soon). From an administrator command prompt run the following additional deletion statements. In most cases these steps alone are sufficient to solve the problem. In the cases where this has not worked, the technique of register an older version of mscomctl.ocx and then re-register the current version has worked after performing the steps above. 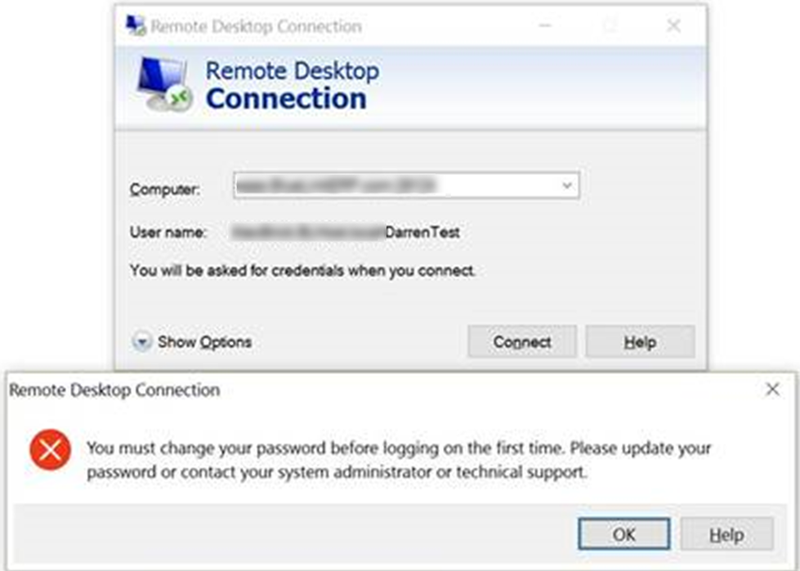 For those of you who have upgraded to Microsoft Office 2016 and are using Microsoft Skype for Business 2016 with Microsoft Office 365, you may have noticed a seemingly endless authentication loop where after having successfully signed in with your Office 365 credentials, you keep getting prompted to indicate if this is a work or Microsoft Account. This basically makes Skype for Business 2016 (Lync’s new name) unusable so we opened a case with Microsoft to try to get a fix. 4. You may have to reboot the computer. Start Skype. 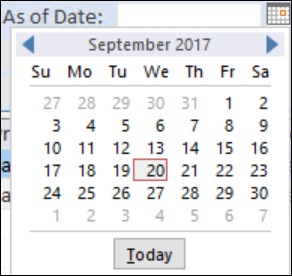 You will be prompted once to enter User/Pass to access corporate address book. The other issue that we’ve noticed with Skype for Business 2016 is that after a few minutes of use the backspace key stops working in message replies and you’re stuck having to highlight words that you want to delete and use the DEL key instead. We haven’t got a fix for that one yet, so my personal recommendation is to just avoid Skype for Business 2016 completely and revert to Skype for Business 2015 which is part of the Microsoft Office 2013 media. 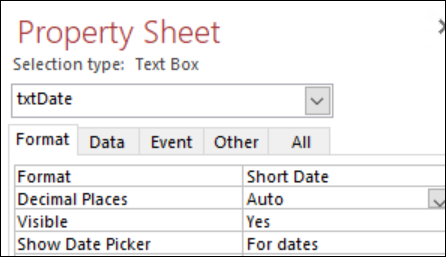 To do this, in Programs and Features, select Microsoft Office 2016 and choose change. Remove the checkbox beside Skype for Business 2016. When that’s done, go back into Programs and Features and this time select Microsoft Office 2013 (assuming that it is still listed) and choose Change. 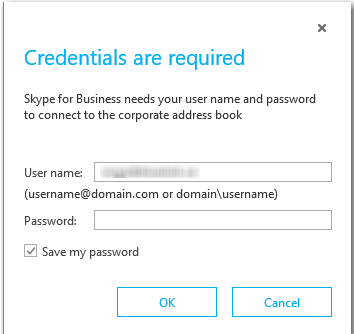 Check the checkbox beside Skype for Business 2015. When done, you’re back up and running on the stable release of Lync (Skype for Business 2015) and aren’t stuck in endless authentication loops and you can actually use the backspace key. I’ll update the article later when we get a solution to the backspace key. For the moment we’re going to block the upgrade of Skype for Business from our volume media setup files.